Is it possible to make thick raw milk yogurt in the Instant Pot? In other words… can you skip the pasteurizing step, retaining all the raw goodness of your milk, and still end up with thick yogurt? When I first started making yogurt, I didn’t want to pasteurize my milk like all the recipes called for. Yet I also didn’t want to end up with runny yogurt — like everyone said would happen if I didn't heat my milk first. I tested making yogurt with raw milk anyway (that I didn't heat up). I guess I had to see for myself whether or not it could work. And I was sooooo disappointed, even though I should have expected it. My family really wanted thick and creamy yogurt like you can get at the store! However… it is possible to make thick raw milk yogurt. It takes adding a special ingredient (that is very good for you, by the way). I've been doing it for years now. Like clockwork, every week. Thick, delicious, creamy yogurt. Nowadays, my family couldn't live without our homemade yogurt. They miss it so much if we're out. It tastes and feels waaayyyyy better than store-bought — and it's waaayyyy healthier and cheaper, too. First, I showed you how to make that thick raw milk yogurt it in the dehydrator (get the free recipe here). 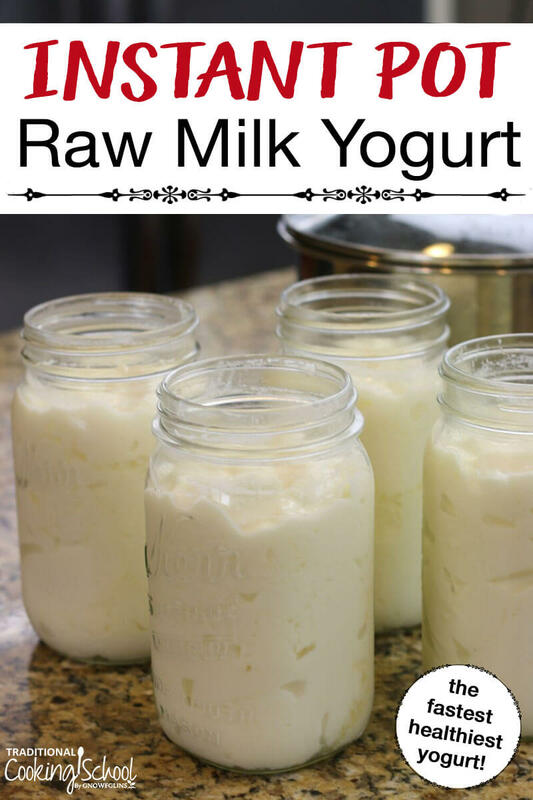 Ready To Make Raw Milk Yogurt In The Instant Pot? I'm glad you're here and I'm thrilled to be showing you how to make thick raw milk yogurt in your… Instant Pot! You need less than 5 minutes to get it going, and then the Instant Pot does all the work! It's really amazing and easy and it will change your life! It has mine. 1. It's helpful to have an additional insert pot for your Instant Pot. This is because you'll be transferring the yogurt into the refrigerator for an additional 24 hours to set up fully. If you don't have another insert pot, you won't be able to use the Instant Pot for that time. 2. It's also helpful to have the glass or silicone lid accessory to keep the yogurt covered when it's chilling for 24 hours in the refrigerator after culturing. You could use plastic wrap instead, but because the glass lid is so helpful with daily use of the Instant Pot, I recommend you have one anyway! The other day, a TCS member said she knew she needed a second Instant Pot the day she got her first. Ha, ha — and so true. 🙂 Because you're tying up your Instant Pot for 24+ hours on this recipe, you'll want to have another for all your other cooking. We just got a second Instant Pot (the 8 quart size), and both are in use several times each day. If you love cooking in the Instant Pot, you won't regret having another one — especially when your yogurt is tying up your first one for 24+ hours! Edit: we now have a 3rd 8-quart Instant Pot that's devoted to making yogurt… that's almost all it does! 4. You could make your yogurt in jars instead of the insert pot as I'm doing here. However, I tend toward maximizing batch sizes so I like being able to make a gallon or more of yogurt right in the pot. If I used jars, I'd be making much less yogurt overall. That wins out over the convenience of jars. It's up to you, though. 5. Yes, you can make this recipe with pasteurized milk as well. I tested it out a couple weeks ago and it not only works like a charm, but you get to skip the initial heating and cooling of milk… which saves a TON of time. 6. Adjust the culturing time and batch size to suit. For culturing times, culture as little as 8 hours or as much as 24. (You set your Instant Pot to the time you want… so easy.) For scaling amounts, you'll see in the recipe below that I included the “formula” with each ingredient — so you can scale up or down depending on how many quarts you're making. And now, for the recipe for thick raw milk yogurt in the Instant Pot… Enjoy! Is it possible to make thick raw milk yogurt in the Instant Pot? In other words... can you skip the pasteurizing step, retaining all the raw goodness of your milk, and still end up with thick yogurt? Absolutely! Makes 1 gallon (or more or less if you scale up or down). Put a few cups of raw milk in the Instant Pot insert pot. Whisk together milk and gelatin. Next, press "Adjust" once so the display reads "Boil". While stirring constantly, let the milk heat just enough to melt the gelatin. You can tell it's ready when there are no more flakes of gelatin visible in the milk (bring up a spoonful to check visually). Add the rest of the milk to the pot. Put the lid on the Instant Pot and turn the venting knob to the sealing position. Press the "Yogurt" button. Use "Adjust" if necessary, to put it on the "Normal" setting. Next, using the -/+ buttons, adjust time. (6 to 8 hours minimum; up to 24 hours for GAPS or THM.) It will soon turn on. When done, put a glass or silicone lid on the insert pot and transfer to the refrigerator for 24 hours to set up fully. IMPORTANT! Skim the cream that rose to the top, if desired, for sour cream or making cultured butter. Divvy up the yogurt into smaller jars (optional) or serve from insert pot. Have you made yogurt in the Instant Pot? How did it turn out? Are you going to try this method? Does one have to obtain powdered starter for this rather than using an existing batch of yogurt? Susan ~ You can use store-bought yogurt as a culture. 2 Tablespoons per quart. You can’t use raw milk yogurt, though, because it’s not a pure yogurt culture. It might work for a time or 2 but wouldn’t be reliable long term. So you can never use raw milk yogurt then. If you’re always making with only raw milk, you always need a starter culture? I buy raw milk yogurt all the time and thought about using it to make my own (it’s just so expensive to buy) with my raw milk I buy. It sounds like that will only work once and then I need to rebuy a raw milk yogurt and do it again? You can preserve your own culture but you would have to pasteurize the milk in order to get a pure culture. You could do this for occasional batches. Or else use a purchased culture each time. I’ve been making Bulgarian yogurt in a yogurt maker but just bought an Instant Pot. I pasteurize the raw milk. Would alternating making one batch in the yogurt maker, next batch sans pasteurization in the IP allow me to continue using the same starter? Switching between the yogurt maker and the IP should not affect the continued use of your starter. However, you need to save the starter before adding the gelatin. The recipe calls for 1 to 3 teaspoons of gelatin per quart of raw milk. You can scale up or down accordingly. If you’re using the higher amount (3 teaspoons per quart) and your yogurt was too thick scale back on the amount of gelatin until you get the thickness you like. Hi. Can you use previously homemade yogurt instead of yogurt culture? I currently use a few tablespoons of my previous batch in the instant pot. If it was raw milk yogurt, it isn’t a pure culture (the raw milk organisms are in there, too) and that means it may or may not work out in terms of culture/taste. You could still try it though! I bought the spoons you linked to, but they’re labeled “tad”, “dash”, etc. Which one corresponds to 1/32 teaspoon? These spoons say Tad, dash etc.. Not the actual measurement needed. So which one of these mini measuring spoons do you use? Also which one to use if you half batch? I thought something was considered raw as long as it was heated to LESS than 180 degrees. So, if that’s true, if you heat your raw milk in this way, wouldn’t you get a good reuseable culture? Your post indicates otherwise? ?You’re just barely heating the raw milk to dissolve the gelatin. You are not pasteurizing the milk. ?The Yogurt function on the Instant Pot maintains the temperature around 110 and 115 degrees in order to culture the yogurt. ?Since you’re not pasteurizing the milk to start with there are other cultures in the raw milk thus the yogurt culture will not pure and reusable. I am really glad you shared this today. I have my second batch in my insta-pot. My first bombed big time and turned into cheese. I ended up boiling it today and I am sad. Raw milk is good! But, I wanted to test it. I normally make in a pan and incubate in an ice chest. I will have to try your idea next. I have made it in the IP three times now and still can’t get it right. This time I did it with gelatin and it has so much whey it is ridiculous! The first two times I didn’t use gelatin, but the first time I had cheese curds, the second soup. Goodness. I can’t comment on the first 2 times without gelatin, but on the 3rd with gelatin: If you had a lot of whey, that means it started separating. I get a bit of that because I want to do a 24-hour ferment (to reduce lactose) — you could ferment for less time and experience less separation. hMh ~ Sorry you didn’t like it! The Instant Pot is an electric multi-purpose appliance. It has a crockpot (slow cooker), rice cooker, saute function, keep warm, pressure cooker (high and/or low), and even yogurt maker, among other settings. Tomorrow on #AskWardee I will be comparing various models and sizes so that people can make the right purchase decision. Check it out if you’re able! http://askwardee.tv and look for episode #48. Instant Pot is the brand name of an electric pressure cooker, but it has many other capabilities other than just pressure cooking. I use my Instant Pot to make rice, beans, stews, soups, pot roast, bone broth, porridge, and of course…yogurt. It also has a slow cook function. I love mine! I want to try this, but wondered if I can use whole plain organic yogurt as the starter culture to inoculate my raw yogurt in the Instant Pot. Do I need to buy the starter you mentioned? Natasha ~ You can use a store-bought yogurt as your culture. The raw milk yogurt itself doesn’t make a great culture because it’s not pure (there are raw milk organisms in there as well). See comments above for more info. Thanks for your question! Do we need to use the starter culture for future batches or could we use some of the yogurt we just made as a starter for the next batch? Oops. Just saw you answered this already in the comments. . .
Karla ~ On my set, the 1/32nd teaspoon is “smidgen”. It’s the 2nd smallest one. If yours are the same as mine, they go from biggest to smallest: 1/4, 1/8, 1/16, 1/32, 1/64… 🙂 Thus, the 2nd smallest one. Would you start at Step #8 if you have pasteurized milk? I have been using my Instant Pot all day catching up on some cooking I needed to do. I love it! Ok, Im still confused. If I use pasteurized milk with gelatin, I still need to heat it first? Like the boil part? How is that faster? Oh ok, I just sprinkle and bloom my gelatin over the cold milk and whisk in. Nice and thick yogurt. I just think that using regular culture will not work for this, am I right? You have to use the special ABY-2C one? Please explain why you measure the culture at 1/32nd teaspoon x 4. Wouldn’t that add up to 1/8th of a teaspoon. Is there some unique way to add this culture to the milk? Vikki ~ That’s a great question! I left it at 1/32nd teaspoon per quart x 4 so that everyone would know the formula. You can definitely combine all into 1/8th teaspoon, provided you are making 4 quarts of yogurt. Enjoy! Hi, I don’t have a yogurt setting on my cooker. Is the keep warm setting too hot? I could try it but thought you might already know/have tried, without me wasting ingredients. Thanks! Thanks for the answer–I figured you’d know! I don’t know what “yogurt more” means–it’s temps are in range, but they do seem awful hot. I use 3 Salton individual cup yogurt makers or a cooler with very warm water. I do like my yogurt in cups because it seems once you dip into a larger container, it starts to weep and separate. I leave mine long enough that it’s almost a Greek type yogurt. It’s just me that eats it too, so for me the 15 jars last about 10 days unless I’m cooking with it. I think they might be more economical too as they only run for 8 hours and don’t have a lot of wattage. Does the yogurt need to set up undisturbed for 24 hours or could I go ahead and put in the the jars for storage and then refrigerate? If it does need to set up undisturbed, could I put the milk in jars with the culture and then put the jars in the instant pot on the yogurt setting. I can get 2-3 quart jars in my instant pot. Then my instant pot would be free to use for other things. Thanks. Rhonda ~ Yes, it does need to set undisturbed until it’s chilled thoroughly. This could be as soon as 12 hours but I usually wait 24. For the quart jar option, definitely! See #4 under “Before You Begin…” in the post. You’re right; 3 quart jars will fit. I would put them on a towel to prevent breaking. You might also put some water in the bottom; I’m not sure whether or not that’s necessary. I used raw milk that was about 1 week old. It still smells and tastes fresh. I made 42 ounces as that is what fits into my yogurt maker jars (don’t have an Instant Pot) and used 2 Tbsp gelatin as I misread the measurement. I cultured for 12 hours and the milk separated. I refrigerated for 24 hours, and it all set up. I stirred it all together and it tastes fine but looks a little lumpy. Is the separation normal? Maybe due to the milk not being day 1 fresh? Or maybe using too much gelatin? Anyway, I’ll definitely try again as I love being able to keep the milk raw and get a thick yogurt. The separation is normal. Yes, that is way too much gelatin for a little over a quart of milk. 🙂 It would explain the lumpiness. Has anyone tried this with goat milk? With goats milk do I need to add more gelatin or change the recipe in any way? You may need a little more gelatin. Yogurt made from goat milk tends to be thinner than yogurt from cow milk. The breed of goat can also produce different results. You’ll want to experiment to get the perfect thickness with your goat milk. Thanks so much for this recipe Wardee! I’ve definitely missed the thick texture of yogurt since switching to making raw milk yogurt. Just one more reason this Instant Pot is climbing to the top of my wish list! SO MANY USES! Do you recommend another brand of grass-fed gelatin other than Great Lakes? We have GL and I find the taste to be a little overpowering in most recipes. I would love one that’s truly “flavorless” because I know how great it is for us! Could this be done raw goat’s milk? I am sorry if someone else already asked this question. I would love to start making this for y family. How does everyone flavor and/or sweeten their homemade yogurt? Shari, in my family, some of us enjoy it plain–nice and tangy! To flavor/sweeten it, honey, maple syrup, and homemade preserves have been stirred in. In the summer, we like fresh fruit chunks in the yogurt. In the cooler weather, we enjoy homemade granola on top of the yogurt. Goodness, now I’m hungry! God bless. Hello, how long will the ABY-2C yogurt culture last if I make yogurt 1 gallon at a time? Thank you! Anxious to see answer. A gallon is a lot for one person to consume as yogurt in a week. We have a small raw milk dairy, guernsey cows, and make a lot of yogurt to sell. I have a customer that had yogurt for 3 months and it was still good. it lasts a very long time and the older it is the thicker it gets actually. it never lasts that long around here though. I only bring my whole milk to 115 degrees and use a cooler with the water a little hotter for the cooler to take up some of the heat. I use ABY-2C culture only and let it culture over night and then right into fridge to cool and set. (of course it is in individual containers for sale into the cooler) My yogurt is not going to be like what you get in the store because it is better. There is only the best raw milk and culture in it. no thickeners, preservatives, nothing. If you want it a little thicker strain it. Only my 2 cents and what we do on our farm. It does 8 gallons of yogurt. Thank you for the links Millie! Very helpful. Wendy, also: I store the culture in the freezer in between uses. I’ve had the larger size bottle keep more than a year (maybe 2?) that way. It would probably last longer but we go through it! The large,120 gallon, link is no longer valid. Can this be found elsewhere. A google search is not turning up anything similar. I am wondering about the gelatin as Im vegetarian. While I drink Milk, I try not to eat anything else such as gelatin which is from hooves. Is there a vegetarian option? There is agar agar. This requires boiling for a few minutes to activate it. We can’t comment on how to adapt this recipe, but it might be worth investigating. You could also just leave out the gelatin. Many people report their yogurt turns out great (though perhaps not as thick). Instead of cooling the yogurt in the fridge for 24hrs. in the liner pot, is it possible to just transfer the yogurt into quart mason jars and then cool it in the fridge? That way you won’t tie up the liner pot. You could try it. Wardee hasn’t done this. 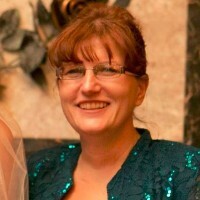 Wardee did receive a private comment from someone saying she had stirred before chilling. After she chilled the yogurt, it did set up. So we think it *could* work to transfer to jars because that would be similar to stirring. Let us know if you do try it! SUCCESS! I followed all the instructions for the 24 hour fermentation (except that I used 8 TBSP of store bought yogurt as my starter). After the 24 hours in the Instant Pot, I used an immersion blender to blend the gelatin throughout, as it had basically congealed the bottom portion of the yogurt only. Then I transferred the yogurt to stainless steel bowls & refrigerated overnight. I’m happy to report that the texture was smooth & even- no gelatinous clumping! I do this routinely. Pouring into my individual jars and refrigerating. I use vanilla for flavoring. Can this be done with nut or coconut milk?? We are a lactose free house since my son has tummy problems. We both love yogurt and I would love to make it at home for him. Thanks! I am making yogurt in my new Instapot. The lights are on, setting is yogurt and normal. It’s been on for over 6 hours, the timer is running, but the pot isn’t warm to touch. Is this because yogurt is made at a low temp? I made rice and beans last night and it worked perfectly. We made this and the flavor was amazing, however, we ended up with a chunky texture which I thought could be remedied with an immersion blender. That created a soupy texture. Any thoughts? The gelatin might not have been fully dissolved or you used too much of it. Next batch give it a very good stir and/or try a little less gelatin. The immersion blender does what happens when you make a smoothie — it’s get thinner and drinkable. I was wondering about the immersion blender idea, so thanks for the warning! I might try just using a wire whisk, or even the egg-white whisk on my hand mixer. Both of those would be less aggressive, and might keep the molecules together. How and when do I add flavoring (honey, fruit, vanilla etc.) to the yogurt? I’m curious when I would add flavorings such as vanilla or fruit? Would I do that prior to refrigerating for 24 hours or after that before I put into smaller (quart size) mason jars? Thanks! Hi there! I just got my IP for Xmas (bc of your posts) and love it!!! How do I make this THM? Do I strain it and skim it? If so, do I strain in the fridge once it’s done? If I skim it, is it basically fat free? If I don’t skim it and incubate 24 hours, how low carb is it? I’m eager but have never had success with my raw milk making great yogurt. I can’t wait to change that though!!! Rana ~ Yay, how exciting! You culture for 24 hours. Then after chilling, skim the cream away to make butter or use as sour cream in S meals. The resulting yogurt has very little lactose (due to the 24 hour culturing) and very little fat (due to skimming it). The milk must be non-homogenized for this to work. Which your raw milk is. How much store yogurt do I need for starter instead of powder? When I make this, I wind up with a layer at the bottom of the pot of gelatinous yogurt (I presume from the gelatin settling to the bottom) even though I was careful to make sure that the gelatin seemed fully dissolved and there were no flakes. Perhaps I used too much gelatin? Or would it help to check on and stir the yogurt occasionally throughout the culturing and chilling times? Quick Question: The recipe states use 1/32t of the culture x4. Wouldn’t that just be 1/8t? I just want to make sure I’m reading it right so I don’t totally bomb right out of the gates. (Before now the only natural food I ever made was salad). Yes. 🙂 It would be 1/8 teaspoon. I made this and it worked great! I would say mine turned out like regular yogurt, so next time I’ll use a little more gelatin. For the scraped off cream – You said it could be used to make sour cream or cultured butter. Do I need to do anything additional to make it into those, or do I just use what I have as either? My first batch came out good but more like a jello texture than creamy. I also had what looked like a layer of fat under the sour cream, is that normal? And if it’s fat from the whole milk would I scrape it off and toss? Thanks so much!! So excited to perfect my recipe each time. You can reduce the amount of gelatin to make it less solid. Was the layer under the sour cream whey? That’s normal. You can stir that back in for more protein. I used 4 tablespoons of vital protein’s grass fed gelatin, so do you think 3 would be plenty or less than that? The layer was under the sour cream so now I know to stir that back in. (: Thanks so much for the response! I just made this 1 gallon recipe. There was a slimy layer under the sour cream, and as we ate it could detect it throughout the recipe. Is this normal? I skimmed off what I could with the sour cream and then mixed the rest prior to eating. It got more slimy as we continued to eat it. The taste was fine but the slimy feeling was not a favorite for us. Less gelatin? Or anything else that can be done different? Less gelatin would be a good first adjustment. If you found this didn’t improve the texture, it may be the starter culture. Different cultures produce different results. I’ve found some my family really enjoys and others with a texture not as pleasing. This is especially true if you are using plain yogurt as your culture as opposed to a commercial culture. Would it be possible for someone to test these Instant Pot recipes with a regular pressure cooker? One that is not electric? I do not own an Instant Pot and I would like to know more specifics on time duration, pressure setting needed, and accessories used for each of these Instant Pot recipes, please. Thanks for your question! You won’t be able to make yogurt using a stove top pressure cooker. It’s not possible to keep the temperature low enough. 1) I don’t have access to raw milk. If you use pasteurized milk, then you don’t have to heat the milk prior to starting this recipe? If using raw milk, you do heat it and then cool it and then proceed? 2) If using pasteurized milk, is it a must to use the gelatin? I know with raw milk you need in order to thicken it. If using pasteurized milk and adding gelatin, would that make it more the consistency of greek yogurt? 3) I know you can use store bought organic yogurt with active cultures or a powdered yogurt starter with this recipe. How do I know I am getting the active cultures that have the most benefit for me? Thanks Wardee for all you do. I know I greatly appreciate what you do in helping me reach my traditional cooking/eating lol goals. 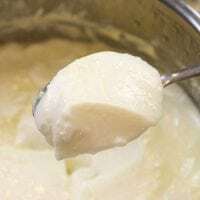 1) If you want to make yogurt with pasteurized milk, you can make it exactly like this recipe states with the gelatin and everything and not heating up the milk very much. 3) You can’t save a bit from a batch of raw milk yogurt to do the next batch. The naturally occuring bacteria in the raw milk will make things funky. But with pasteurized milk you have this option. Usually store bought yogurt lists the cultures used, just like the culture powder Wardee recommends lists the cultures included. Hello! … may I ask, is the yogurt culture that you use (ABY-2C yogurt culture) make a nice ‘tangy’ yogurt? We really enjoy that taste in a yogurt … just curious what your impression is of the taste? … thank you! Oh lovely! … that is super helpful to know. We’ll give-it-a-go then. Thanks a lot! My yogurt came out too watery and looked like ricotta cheese. It taste good though. Should I have strained it? Was it chilled completely and still watery? You shouldn’t need to strain it but you can if you need to for this batch. Yes. I waited 24 hrs in the refrigerator before we tried it. Hi, can you tell me what the difference in end results would be for letting the yogurt culture in the IP for 6-8 hours vs 24 hours? I’m not sure where to start in that range. To keep raw milk as a raw yogurt the temperatures need to be kept under 115 degrees. This recipe does that. Recipes you see that indicate to heat the milk to anything higher than 115 are no longer raw. How does Raw Milk Yogurt fit into THM? Is it an S, E or FP? Tried this last night with 1 gallon raw milk. Didn’t have the starter but used store bought organic greek yogurt, but only 2tbs – not enough from what I’m reading through comments?? I had an inch layer of cream on top, and a solid inch of gelatin, I’m assuming I used too much. The bottom layer looks somewhat like yogurt, but I don’t actually like yogurt so I can’t taste and tell. Have a wasted a gallon of raw milk? 2 TB is not enough for this amount of milk. You need about 4x that. If it’s really thick on the bottom but not the top (after chilling completely) it means the gelatin wasn’t dissolved enough. I followed the directions exactly… on step 11… turn the venting to sealing position and I did it and I don’t think it got enough steam to seal… is that correct? I’m brand new to the instant pot and this is my first use of it besides the water test and the steam value worked perfect. No pressure is used with yogurt setting, lid just closes it off. You could also use a glass lid if you have one that fits so you can see inside. My first batch came out wonderful! It was the best yogurt I’ve ever tasted! Thank you so very much. Hi!! What a great recipe!! I am making this for the first time with raw goats milk. Is it normal for it to be still liquid after 10 hours in the instant pot? I scooped some out to put in the fridge and turned it back on for another 10 hours…is that a bad idea? It’s often still quite thin until after it’s been in the refrigerator for 24 hours. With goat milk you may need to increase the amount of gelatin slightly. It tends to be runnier than cow milk. I make 24 hr yogurt in my dehydrator following the recipe I found at Lovingourguts.com. I heat the milk to 180 then add the culture when it cools to 100. I don’t use gelatin. My yogurt is thick and creamy. Will This recipe work in the Instant Pot? If you’re heating the milk to 180-degrees the end product would no longer be considered raw yogurt. Raw milk yogurt, which is kept under 115-degrees doesn’t thicken like it does when the milk is heated to 180-degrees. That’s why using gelatin is necessary to get a nice, thick end product. The Yogurt function on the Instant Pot could be substituted for the dehydrator for making non-raw milk yogurt. how do you tell when to stop the culturing in the IP and put in fridge? You should culture your yogurt for at least 6 to 8 hours but you can go as long as 24 hours. The longer you go the less lactose you’ll have in the final product. Past six hours it is really up to you how long you want to let it culture. You’ll know you have yogurt when it smells yogurty and is thicker than milk. It will not be as thick as the final product because you will need to let it set up in the refrigerator for 24 hours. This allows it to thicken. When I stopped it, the fat was on top, next layer was gelatin, then yogurt on the bottom. I’m wondering if at this point, you could blend it all together on low and then refrigerate it. I mixed it thoroughly and then at about 20 hours took it out and it tastes amazing!!! but it is lumpy. The gelatin I used is beef gelatin powder so I could not really tell when it melted. I used my clean hands to see if I felt any grit and I didn’t. Any tips or suggestions? I am quite pleased even though lumpy. Yes, you can blend the yogurt. I blend mine together after it has set up in the refrigerator. I use my stick blender on low. It sounds like the gelatin was not completely dissolved. I use beef gelatin powder as well. The best way to tell that it is dissolved is to stir the heating milk and gelatin constantly and check for signs of gelatin still visible in the milk. If you don’t see any then you know it’s dissolved. I’ve tried the yogurt twice now, and it’s great. You said at the end to use the cream that comes to the top of the yogurt as sour cream or to make cultured butter. Will it still make good butter with the gelatin added to it? BTW, I recently discovered a handy “hack” for this raw recipe: You don’t have to dissolve the gelatin first! I waited until the milk was up to temp in my dehydrator and then sprinkled the gelatin over it and whisked it in really well. I came back a few hours later and whisked one more time, just to make sure it was totally incorporated with no lumps. Turned out PERFECTLY, with much less hassle. Thanks for the tip. The stirring/shaking step (after it’s warm and dissolved) is very important otherwise the yogurt will be thicker at the bottom than the top. Uh oh. I left my yogurt on the counter to cool a little before refrigerating for 24 hours, and went to bed without remembering to refrigerate itI It sat out all night! is it any good? I do that on purpose every time and it’s never been a problem. My dehydrator timer automatically shuts off close to my bedtime usually, and I just leave it there until morning. So far every recipe I try in the instant pot I mess up the first time. I’m trying to not waste my precious raw milk! Want to make sure I’m understanding. The 24 hour setting is for low heat. The 8 hour is for normal heat. If I want 24 hours for this recipe, I chose the 8 hour option and unjust it up to 24 hours? Really hoping for yogurt, not cheese. Thanks! You’ll use the Yogurt setting on your Instant Pot. When you are ready for the incubation (Step 12) press the Yogurt button. Instead of going by the time it displays, you should instead look at the yogurt setting and put it to normal, then adjust the time between 8 and 24 hours. Have you tried using this recipe with a probiotic powder/supplement? I don’t want to buy a culture if I can use my probiotic powder to culture the raw milk. If it is possible how should I do this? You can make yogurt this way however it might not be cost-effective. It will take around 2 capsules per 1 cup of milk to make yogurt. So you’d need 32 to make a gallon of yogurt. Thanks! My son’s eczema flares when he eats dairy. We are doing the GAPS diet with dairy elimination. I am interested to make raw yogurt to see if he can tolerate it. (He has not had any raw dairy yet.) I wonder if this “culture” will taint the batch because cultures starters are not dairy free. What is your opinion? Since Cultures for Health only sells a Villi Yogurt Culture in a pack along with three other heirloom varieties of yogurt, I really don’t want to purchase it. I don’t plan to use the others. What yogurt culture does Wardee use since Cultures for Health has redone their product line? Thank in advance. We doesn’t use a countertop yogurt culture much, so we don’t have a replacement. Wardee makes kefir (which is our countertop “yogurt”) or yogurt in the Instant Pot. I have a Power Pressure Cooker that does not have a yogurt setting. Do you know if I would be able to make the yogurt in my cooker? If so, which setting would be the correct one? The yogurt setting on the Instant Pot is a very low temperature perfect for culturing the yogurt. Any other setting on an electric pressure cooker will be too high. Sorry! Thank you! I am going to try the dehydrator recipe. I live in Fla and you can’t buy raw milk here. Can you use any other type of milk to make yogurt? Raw milk can be purchased as pet food in Florida. Here’s a link where you can search for raw milk suppliers: https://www.realmilk.com/. You can make yogurt with organic pasteurized/homogenized milk (not ultra-pasteurized) milk. You will not need to add gelatin. Raw milk yogurt does not thicken like pasteurized/homogenized milk which is why we need to add gelatin. What brand gelatin do you recommend? I currently have Axe Naturals Collagen Protein – is this suitable? If not, please advise. Is it better to use newer raw milk or older raw milk? I get pasteurized NON homogenized whole milk. Is there anything different I should do? You would not need to add gelatin. Unpasteurized, or raw milk yogurt, doesn’t thicken like it does when the milk is pasteurized. That’s why using gelatin is necessary to get a nice, thick end product. Do I have to make a whole gallon of yogurt? I would never be able to eat all that? Can I make just a quart? Yes, you can make just a quart. Is the sealing ring required when making yogurt? I have ordered a second one because the one I currently have has taken on the odor of all the soup and meat I cook. I’m making a batch of yogurt right now with the ring, but am wondering if I can get away without it in the future. Thanks! We have never made yogurt without using the ring. I would worry that it wouldn’t be completely insulated against drafts and that the appliance would have to be “on” too much to keep it warm. Just our speculation, we don’t really know. You could ask Instant Pot customer service what they think. I made this recipe and followed the instructions. Had it in Yogurt function for 8 hours and then set in the fridge for 24 hours to set. It tastes good but is a little more sour then I would prefer and pretty runny. Is there a way to thicken it after the fact? Any tips for next time? If your yogurt is runny and separated you can strain it through a cloth to drip out the whey. Next time you could increase the gelatin slightly. If it is too sour for you you can add in a sweetener of your choice (I like stevia or maple syrup). In your next batch culture it for less time to get a less sour taste. And i used raw milk. How long will the yogurt last in the fridge? This can keep for at least a week, and maybe even several weeks, in the fridge. I made a version of this in my crockpot decent results, but have ordered an Instant Pot. I’m curious about whey with this recipe. Does the gelatin allow whey separation? If so, is the whey usable for making ferments such as sauerkraut and beet kvass? This recipe doesn’t allow whey separation because it’s thickened by the gelatin. There may be some initially before chilling but don’t try straining then because the yogurt will go out with the whey. I am really happy with my first batch. I used store bought organic milk because I didn’t want to use the expensive raw milk for practice. It tastes great. It wasn’t really tart even. I might use a little less gelatin in the next batch to make it a little creamier. I can’t wait to try with real milk! So I’m so excited about making raw milk yogurt, as I’m not a yogurt fan, and after trying my friends homemade yogurt it changed my mind. So I made 2 quarts, using the gelatin you suggested. 1 quart using 2 TB of purchased yogurt and another quart with a freeze dried “starter”. Results after 18 hours in instapot: purchased yogurt looks FABULOUS… 2nd QT. is 1/2 thick yogurt on top and 1/2 fluid on bottom. HERE IS MY QUESTION: What to do with this food? Is the top sourcream/greek yogurt??? is the bottom just whey to use to laco ferment? Or can you blend it back together??? THANK YOU for your encouragement! I made the yogurt in the instant pot and was so excited but it never set up. The only variation i did was put it in quart jars after the 24 hrs in the pot and BEFORE putting it in the refrigerator. Is this where I went wrong??? Can I salvage it? Thanks in advance! I jar my Instant Pot yogurt before putting it in the refrigerator so I don’t think that was the issue. It could have been that the gelatin was not fully dissolved or that you need to increase slightly the amount of gelatin you used. If you have yogurt curds but they are just not super thick you can strain it through a cloth to drip out some of the whey. Otherwise, if it is too runny you can still use it in smoothies or frozen popsicle treats. I have made this yogurt about 6 times and it has always been good. I just opened my 7th batch and it is all liquid. I can only wonder if the starter is old. Does that happen? I have had it about 4 months. I noticed that it was a little clumpy, but since I had already put the gelatin in, I used it anyway. Insight? Starter culture does have an expiration date. It is possible it could be old. Also if the gelatin was not dissolved properly it may not set up as well. If I wanted to make Vanilla yogurt how much extract should I use? We have made vanilla but don’t measure the amount of extract we use. I have seen 2 Tablespoons per gallon in other recipes. The recipe says 1/32 t X 4 isn’t that the same as 1/8 t? Yes, you are correct it is 1/8 tsp. 🙂 We have it posted this way so someone can scale up by the quart. Are these the same cultures that you recommend? Hi, can you freeze this raw milk yogurt or will it kill the good bacteria, enzymes, etc? Will to taste good after being frozen? Yes, you can freeze raw milk yogurt. It won’t kill the good bacteria or enzymes — it will just slow them down. I can’t say whether the consistency or taste would be different after freezing. If you try it, please let us know! Hi, thank you for this great tutorial. My question is: how can I be sure the yogurt setting (Insta Pot) does not go above 115F, as to protect the natural cultures? The Instant Pot yogurt setting is pre-programmed so it can’t be changed. You could heat water (or milk) using the Yogurt setting and test the temperature every few yours to see if it is staying consistent. I know this is an older post, but I was hoping for some input. I love yogurt. But I had to stop dairy because every time I eat I get a slightly swollen double chin, night sweats, and snore. I tolerate all fermented foods so it’s just the dairy. But I feel so much fuller and refreshed with dairy, I miss it. I don’t wish to harm my body or my nursing baby but what do you think about a teaspoon of 24 hour yogurt a day until I work up to a cup (I would expect that to take months)? I was also thinking about adding ghee and undenatured whey (that removes the casein)? I am about to start a diet mixing Body Ecology and GAPS because it makes the most sense to my body. Would greatly appreciate input. Thanks! You could certainly try what you’ve suggested, but if you are having issues with dairy, it would be best for you to talk to your doctor or a GAPS practitioner to find out what would be best for you at this time. It’s possible that after some time of being off dairy, you could reintroduce it after your body has healed. I buy and drink raw milk from grass fed, A2 genetic Jersey cows, and make butter, cheese, and kefir from it. I’m puzzled about something and was wondering if you could answer the following questions for me. If I use the full yogurt setting on the Instant Pot that basically pasteurizes the milk prior to my inoculating it with culture, is it really a problem? I found a yogurt that I really love. It has quite a few more bacterial cultures in it than most yogurts have listed. It has a lovely, lovely taste and I would really like to get a true culture going of it to be able to use as my starter each time I make yogurt. My thoughts are, since I’m already getting all the goodness of the milk from consuming it raw and using it in my kefir, cheese and butter, do I really need to still have the milk remain raw for the yogurt? Won’t the yogurt cultures also be beneficial on their own without the competing bacteria from the raw milk? Won’t the yogurt cultures themselves still make it very digestible and highly nutritious as well? I’m thinking if I go ahead and heat my raw milk then I could always use the resulting yogurt I make as my starter over and over because the enzymes wouldn’t be competing with each other. Yet, it would still be just as nutritious wouldn’t it? After all, aren’t the yogurt cultures also turning the milk into something very beneficial for the body without the need for the milk to still be raw. It seems that way I’d be getting a true yogurt without competing bacteria from the milk, which could also be a good thing. Correct? Seems to make sense to me but please tell me if I’m missing something. Will raw goat milk work ? I don’t have access to raw cow’s milk? I was wondering if gelatin was necessary? What would happen if it was not added, and how do you scale this recipe down to half a gallon? I can’t consume that amount of yogurt. Yes, gelatin is necessary. Without it, the yogurt will not set and will be a liquid. To scale it down to a half-gallon, just cut the amount of all ingredients in half. 🙂 The times don’t change. The milk I bought from Costco is organic whole milk and says it is “Ultra Pasturized” on the carton. I read in the comment and answer section here you can’t use that for yogurt and wanted to make sure I read it correctly before I make a batch and it turns out bad. Do I need to go back to the store and get whole milk and then follow the rest of the recipe? Ultra Pasteurized milk is not a fit option for making yogurt. I’m sorry. I cultured it for 22 hours and chilled it for 24 hours. Thanks again! If I can tweak my recipe a bit, I’m excited at the possibility of making super easy raw milk yogurt regularly. You could strain out this batch but for future batches I would slightly increase the gelatin until you get the consistency you like. You may also want to try a different culture to see if you get a better consistency. You might consider updating your link for the yogurt culture. The linked product on Amazon is crazy expensive & looks to be a very large quantity. I could be mistaken, however, I have begun purchasing it here, https://www.getculture.com/ABY-2C.html and have been happy with the product & price. Love this recipe by the way. I have successfully made it dozens of times using local pasteurized non-homogenized milk (as that was all we had accesses to) & now make it with half that kind of milk & half raw milk. I use 2.5 Tbsp of gelatin & love it! Thanks for sharing & helping make our real food journey a delicious one. I am experimenting with raw milk yogurt and using gelatin to make it thicker. But, I also like to get whey from my yogurt for other fermenting projects. Are there other options for getting whey other than from yogurt? Thanks, I really enjoy what I’m learning from this site. Do I have to use the same cultures and gelatin for this recipe? I am looking for a smaller quantity to see if my family likes it first. Would I use the same measurements if I use different brands? You can use any quality brand of gelatin and any quality brand of Thermophilic Yogurt Culture. If you make a smaller batch, say half as much as this recpe than use half the amount of each ingredient, including culture and gelatin regardless of brand. Hi can I buy any starter culture or do I have to use the one you linked? You can use any quality thermophilic yogurt culture. The ones mentioned in the post are simply recommendations. Hi! Thanks for all your recipes and shared ideas. I know you used to have your own cow so you may know the answer to this. After milking my cow, can I pour the milk directly into the instant pot and start the yogurt? Or is the cooling of the milk essential in some process or bacteria relationship? Wardee says yes you can! You will want to do the normal straining steps that everyone usually does. Make sure it’s Wardee’s recipe with the added gelatin or else it might not set up. Wardee LOVED making kefir and other cultured dairy straight from the cow. They were perfectly warm and ready to start! I have started making Instant Pot yogurt with local milk and love it – thank you for the inspiration, Wardee! You mentioned that you can skim off the cream to make sour cream or butter. So would I make the yogurt, then skim the cream and leave it on the counter to culture? Or is it better to skim the cream before making yogurt and culture it that way? Which is preferable as far as probiotics go? Do they taste the same? I just put my first gallon of raw milk in my instant pot to make yogurt this afternoon. I’m excited to see the results. I have a question about straining. I’ve seen other ways of making yogurt which requires straining the whey for several hours to make Greek yogurt. I see this recipe doesn’t require this. Is that because of the Gelatin? Just making sure I’m doing all the steps correctly to get good results. Thanks. My husband and two boys, especially my 15 year old, could NOT stop telling me how much they love this yogurt! SO many repeat comments from them! So sweet. I’m thankful I didn’t have to fiddle around with the ratios by creating my own recipe; your recipe turned out perfectly the first time, and now I make it weekly. NOW I need to buy my second IP! Thank you for such a beautiful recipe that nourishes us and makes us happy! I used this recipe in the Instant Pot Ultra 8 quart. I did the jar method. I heated about one cup of milk in the pot on the sanitize, low, no pressure setting until the gelatin dissolved. I used two tsp per quart jar. I then transferred the milk/gelatin mixture between two quart sized jars that were already filled with milk. I added the two tablespoons of starter yogurt to each jar, then I put the jars on the rack in the Instant Pot and filled the pot with 4 cups of water. I let it ferment over night at Medium (Normal) setting. In the morning I moved it over to the fridge and let it set up for the 24 hours. It tastes just like yogurt! I did notice that one jar was a little runnier then the other. Probably because I doubled the gelatin in the cup of milk and didn’t distribute equal amounts between the two jars. Perhaps next time I will try to heat the milk and gelatin inside the jars so I get the perfect amount. I was also going to ask if you know the outcome of using this method on the Low (less) setting? Would it still work? We have heard from people that it doesn’t culture or set up properly if they use low. Thanks for this recipe! I’ve been playing around with it, finding the right mix of gelatin & timing for my family. I use my raw goat milk, and it’s working great! You mentioned using the layer on top for sour cream. Is there anything special to do with it to make it sour cream? Nope. It will naturally separate while it cultures. Hey there! So, I’ve made this yogurt three times now. Each time using a different store bought yorgurt as my culture, instead of a powder option, so maybe that’s my issue, but it’s never turned out quite right. It always separates a bit while it sets(which is to be expected I’m sure), leaving a gelatinous layer of what I’m assuming is whey towards the bottom, which I mix in once it’s all set and then end up with lots of lumps. Is that normal or am I doing something wrong? Our biggest struggle with the yorgurt though, is the fact that it smells more like sour milk than yogurt… it’s still absolutely edible, but it’s definitely not normal yorgurt. Is it not culturing correctly? It hasn’t given anyone tummy troubles, but it still makes me uneasy. I’m on the verge of just pasturizing my milk first next time to see if that helps. Or do I need to get my hands on a real yogurt starter culture? Thanks for your help! Yes, I do think the raw milk organisms might be competing or then again… if you’re fermenting for 24 hours… being sour at that point is quite normal. The separating is normal, too. You could try fermenting less to see if they like the taste better. Also could also try pasteurizing. We don’t boil, we only heat a small amount of milk at first to dissolve the gelatin in it. Otherwise it clumps. I’m not familiar with cold-soluble gelatin, but if that means it dissolves without heat, then correct, heating the initial small amount of milk is not necessary. After it cooks in the IP in the yogurt setting for 6 – 8 hours…how long do I leave it on my counter for undisturbed? The 6-8 hours in your Instant Pot is the minimum number of hours it is culturing not cooking undisturbed. Once that is done transfer it to the refrigerator undisturbed for 24 hours.